Most of the time an auto battery is charged by the alternator in the car when its engine is running. But if you drive for short distances, don't drive at all for several days or heavily use lights, fans, heaters, audio and conditioner car battery will discharge and may even fail to start the engine before your next drive. 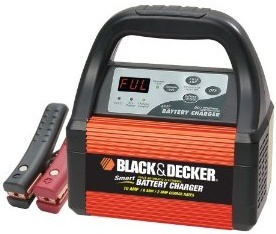 In this case you need a dedicated 12V car battery charger. Read on how to charge a car battery! A lead acid car battery is charged in two distinct stages: bulk and absorption. The bulk stage is where the charger current is constant and the battery voltage increases, which is normally during the first 80% of the recharge. The absorption stage is where the charger voltage is constant and the current decreases until the battery is fully charged, which is typically the last 20% of the recharge. During the bulk stage you can charge the battery with current not exceeding 10% of the Reserve Capacity (RC) rating (knowing amp hours (Ah) of the battery you can approximate RC as AH*2). For example, to fully recharge a 50 AH maintenance free Ca/Ca battery (100 RC) start with 10A current for 4 hours and finish with 16.25V voltage for 2 hours. WORDS OF CAUTION: Do not recharge frozen batteries, allow them to thaw out first. Recharge only in well-ventilated areas because explosive and toxic gasses can be produced during the absorption stage. 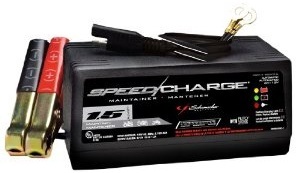 Turn the automotive battery charger off before connecting or disconnecting cables to a 12V car battery. To disconnect a car battery from the car, with the engine off, detach the negative (black) cable first from the car battery terminal, detach the positive (red) cable second. When reconnecting the automotive battery back to the car, attach the red cable first, black second. The best charger types are automatic and smart battery chargers for cars. Such a portable car battery charger stops charging when the battery has approached a full charge by turning off at some predetermined current, voltage cut-off point, time, or combination of current, voltage or time. These chargers have features like selection of battery type; temperature compensation, which is critical if recharging occurs in temperatures other than 80° F (26.7° C); do not produce sparks when the clamps are connected; will not turn on if the polarity is reversed. 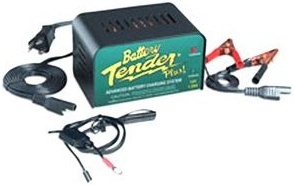 A 4-10 amps battery charger is suitable for battery capacities up to 100 amp hours. 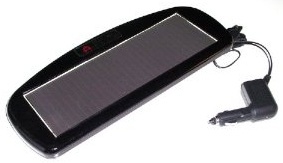 A trickle car battery charger is used to maintain a battery after it has been fully charged. Trickle chargers with unregulated voltage can overcharge and destroy the battery if left unattended - use them only with a timer or manually control the battery voltage. In a dedicated solar powered car battery charger voltage doesn't go over 13.5 or 14 volts and don't ever produce enough current to damage the battery. These you can just hook to your battery and forget.